Hi everyone, my name is Adam. I’m 23 years old and live in New Zealand. For as long as I can remember, I have loved technology, what it could do and imagining all the wondrous things I come up with on the computer. Of course, being quite young back then, that meant creating drawings in Microsoft Paint, playing 3D pinball & playing with ClipArt in Microsoft Works. It had always made me interested how I could interact with something that wasn’t alive but could respond to my interactions. I recall in 1999 being asked by my primary (elementary) school teacher “What do you want to be when you grow up”. Usual responses were “Policeman! Fireman!, Astronaut!”. However, me being a slightly odd child; I said, ‘I want to be Windows!’. Needless to say, I recall a lot of funny looks. But that dream has stayed with me my whole life. School for me was learning about computers, how they worked and how I can make them do amazing things. I started learning code at age 13. C#, Java and html *yes HTML isn’t a programming language, but still :P* This influenced what I wanted to study and pursue in my working life, I wanted to be a software developer. But not just any old software developer, I wanted to be a Software Engineer at Microsoft *Imagine that title in big letters and flashing lights :P*. Right now, I’m working on a couple of projects, 1 is a cross platform App. And another is my first game. I’m developing it exclusively on the Windows 10 platform. I also write articles for InsideWindows Tech news site and I’m also a beta and rare software collector. In August 2014, I read an article about “What’s next for Windows”, it hinted at being very user driven. If I recall correctly, the phrase was ‘Co-creating Windows with you’. Finally I had a shot of being (in some small form); Windows. I became an Insider on the day that Microsoft opened the flood gates to sign up for the program. Immediately it caught my interest, at first, I thought it was the same sort of thing the Windows 7 & Windows 8 previews had been. In the early days of the program, I started following a not-so-publicly-known Microsoft Employee; Gabe Aul. I would read Gabe’s tweets about issues, the build and the feedback. Back then I was too scared to talk to a Microsoft employee; ‘what if I sound stupid?’, ‘He won’t have time to talk to me’. So, I just stuck to the 3 step system for a while. Around November 2014, I was beginning to struggle with mental illnesses. I felt very scared, I did not understand what was wrong with me. I felt very isolated and alone. I had no friends because of this isolation, I could barely get myself out of bed each day. I turned to something I always loved, something that always cheered me up, technology; namely Windows. I started bug hunting more aggressively, submitting feedback daily, I started talking on the forums and user voice, it was so nice talking to people who had similar interests as myself. So, in December 2014, Gabe teased a screenshot about ‘spotting something coming to Windows’. My first tweet to him was ‘FLAC support?’, and he liked the tweet. And back then, that meant so much. That little gesture started a snowball effect on me, that I could just talk to people and not worry if I sound silly or get things wrong. In early 2015, I found myself coming out of my shell quite a bit. I was talking to Gabe on a daily basis and interacting with other insiders. We would all work together on issues one of us would be having at the time. The twitter community we had was small, but so damn passionate about helping one another and getting bugs/issues sorted and voicing suggestions. It was around this time I had asked Gabe to pass on feedback to the audio team, to include FLAC encoding in Windows 10 for CD’s. I was so stoked when I saw the first insider build with FLAC encoding in it! For me, that really hit home how our feedback does shape Windows, it makes it personal when you can say you’ve in some way influenced it. And knowing the whole world would be using this OS in a few months’ time had me extremely excited. So I started pushing harder to report bugs, file suggestions and send tweets to Gabe. I realized that there were more Microsoft people with Twitter accounts, and as the days passed more and more came out of the woodwork. And in a way, they mentored us. Following that tweet, I thought “Heeeeey… What if I photoshop a picture of Gabe…”, I kindly asked Gabe for a photo to edit and he said, “Here you go, have fun!”. I’m quite glad my photoshopping abilities have improved since then! In July 2015 was one of my proudest moments for Microsoft & the Insider community. 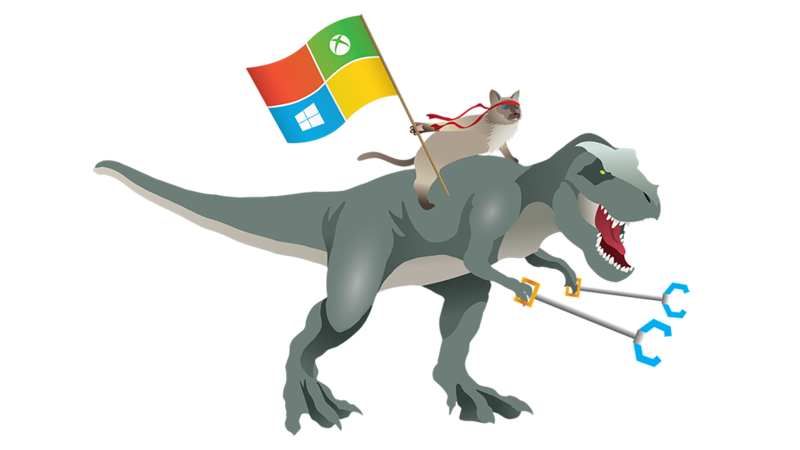 We shipped Windows 10; The Co-created OS! But no time for rest, we had a new build to test out a couple weeks later for the November release. Then before long we had released the first update to Windows 10. As the holidays were approaching, I wrote a few Microsoft people letters and wished them all a Merry Christmas and how amazing working together had been. Fast forward a few months and we are at Build 2016. Gabe is giving his presentation with Bill about ‘inside the insider program’. At the end of the presentation, Gabe put on screen the letter I wrote for him at Christmas. It was hard to see him step away from the Insider Program as I viewed him almost as a mentor. But I knew he was off to do greater things. And this is where we were all introduced to the Ninja Cat Lady! Dona Sarkar. I will be honest, at first, I didn’t like the style change, I was in a state of *BRING BACK GABE* haha. But, as I have gotten to know her and shared things privately, whether it be work, studying, goals, personal issues, she was absolutely amazing to talk too. Going forward, I love the Windows Insider Community, I love what we do, I love the people I get to talk to on a regular basis. The friends I have made and the meaningful relationships I have formed with people I never thought in a million years I’d ever talk too. Mental health wise, this program has saved my life. There is no better way to put it, and I will always carry that deep passion for the community and I don’t just want to help make Windows better for Microsoft. I want to make Windows better because it is something I care about, and when you care about something, you look after it. You improve it. Windows impacts the whole world, and if what I do as an insider helps with that, then I can feel good about know that I’ve helped impact the world. And all insiders should be proud. A big thank you, thank you, thank you to Jen Gentleman, for being that amazingly kind and talented person that she is. Jason Howard for our talks of food and insider feedback. Laura Butler for being just an absolute champ! The 2 Stephs, Ellen Kilbourne, Ben Rudolph, Brandon LeBlanc, Bill Karagounis, Paula, Beth Crane, Terry Myerson, K C Lemson, Joe and all other MS people I have or have not had the pleasure of talking too. Gabe, you inspired me to follow my dreams, you took time to give me advice, help me with issues I had, offer assistance when needed and you invested in my abilities as a person. That truly means a lot to me, I thank you. Dona, you are so kind and wise. You have taught me a lot about people, how to interact. You’ve taken the time to talk to me and invested your time in getting to know me than just another image on a screen. Your kindness and heart not only inspire me, but it inspires all insiders. Thank you. And to our insider community, we do an amazing job, and we help shape something that will and does impact billions of people. There is a lot of good to come out of that and as more and more Insiders4good events pop up worldwide, we will be able to do more! Amazing things can happen when you are in a team or a community of amazing, talented people. Thank you all as well. Hope everyone the best and lets power forward into 2017!